The purpose of the dinners was to network together teachers interested in arts integration in schools across the Flathead Valley. We had workshops and a "Trade Show" of ideas each year. ​Check out these pics from last couple of years. ​Have you utilized your art museum recently? Discover ways to incorporate museum visits and outreach programs to make art a pART of all your classes and IEFA curriculum. You don’t have to leave your classroom to benefit from Hockaday Museum of Art programs. Find out about the art and culture of the Plains Indians through the Museum’s “Traveling Medicine Show”. A mini exhibition highlighting some of the art used in this outreach program will be on display. Beyond cultural history, the items can be a springboard for connections with core curriculum. There will be demonstrations of how to make and use several of the items with your class. ​Does arts integration intimidate you? Do you think you’re not artistic? In this presentation you will experience the joy of looking at art, discussing it through open ended questions, and building your confidence for de-coding a painting. You will leave this presentation feeling more confident about your abilities to integrate art into your classroom. No art experience required! Just bring your eyes, your intuition and an open mind! Jenny Bevill is an adjunct professor at Flathead Valley Community College, a speaker for Humanities Montana, and a content developer for the Montana Office of Public Instruction’s online Teacher Learning Hub. Jenny was the lead teacher for 2017’s Montana Teacher Leaders in the Arts Institute and was the pre-conference speaker for the Montana Arts Council’s yearly Arts Summit in both 2016 and 2017. Before relocating to Montana in 2014 Jenny was a teaching artist at the Guggenheim Museum in NYC for a decade. Jenny is currently piloting an art and mindfulness program for Success Academy, the largest charter school network in NYC. 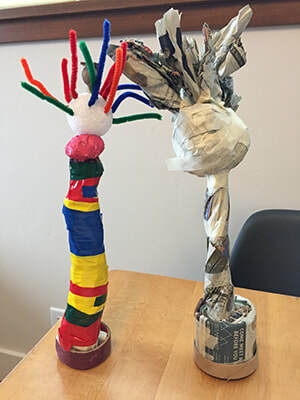 ​As teachers you all wear many hats, Sculpt Your Narrative, is designed to offer a process oriented art-making experience. Learn to visualize your breath with guided breath work called the "rainbow breath". Then, become emotionally exploratory by sculpting personal emotional monsters. Connect with the playful part of art making by shredding, tearing, twisting, squishing and taping newspaper. Involve yourself in the satisfying process of creating your emotional monster complete with physical activity, laughter, and ample opportunities to add written narrative and supportive literature appropriate for the classroom, while fostering emotional and social development. Lisa Pohlman, Art Therapist and Licensed Clinical Counselor is owner of The Whitefish Art Therapy Studio. In Lisa's private Art Therapy practice she works with children and adolescents. Lisa became a resident of Whitefish in 2004 where she lives with her husband and three children. Lisa is a founding member of The Montana Art Therapy Association and active board member since 2008. Beyond her private practice, Lisa enjoys co-facilitating group Art Therapy and has been involved in adult bereavement and cancer Art Therapy support groups. Lisa is a yoga instructor at The Wave and takes every opportunity to play in nature with her family. This two-part workshop will give an overview of the new Montana Media Arts Learning Standards and Resources for classroom integration. Then, "Appy Hour" - learn about iPad apps that will integrate art and technology seamlessly, while also tying in core subjects. Learn innovative and creative ways to push your students' thinking to become artistic creators! Erin and Caroline both teach and coach technology in the Kalispell School District. They come with a STEAM background and integrate K-5 media arts & technology regularly. Wes Hines is a long time Visual & Media Arts educator, faculty for Montana Teacher Leaders in the Arts, and Media Arts content developer for OPI.